Plot: Survival expert Bear Grylls is back in the wild and this time he has brought some people with him. As part of a reality competition series, ten teams of two will go up against each other to survive in the New Zealand wilderness. One team will be eliminated every week with the final remaining team receiving a grand prize of $500,000. I have been a fan of Bear Grylls since his time on Man vs. Wild. Controversy about the show aside, Grylls’ survival antics provided some very entertaining television. If he wasn’t doing stunts like jumping off a massive cliff into a rushing river, he was consuming gross things like a raw reindeer heart and drinking its blood. Yes, the show was straight up DISGUSTING at times, but that was one of its biggest appeals. Get Out Alive with Bear Grylls is his first show since Man vs. Wild wasn’t renewed in 2012, and it’s clear that Grylls wanted to do something new this time around. Instead of his typical scenario of being thrown into horrible situations and trying to survive, Grylls has decided to make other people encounter wilderness troubles in the form of a reality competition series. Half the show requires the full group of 20 people to work together to survive while the other half has them competing in various tasks. It’s more a less a mix of what would happen if you combined Man vs. Wild with The Amazing Race, but in a more concentrated locale. With a show like this, the big questions really are as follows: Is the show fun to watch and does it stand out from the countless other reality competition shows out there? In regards to the show’s entertainment value, it really depends on who is watching the program. If you like the aforementioned Man vs. Wild and The Amazing Race, then you’ll definitely find a lot of entertainment value in Get Out Alive. Watching this group of strangers trying to survive in a region controlled by Bear Grylls is straight up fun. At one point he even has them try to get some food out of a cave and it turns out to be a slaughtered deer carcass. How the deer died isn’t revealed, but I’m assuming Grylls killed it with his bare hands. If that’s not enough for you, the Survival Test of the week has each team compete to drink a mixture of urine and muddy water as fast as possible. Keep in mind this includes building a fire to boil the disgusting mixture to kill the chemicals, cooling it so it’s “drinkable,” and then drinking a full container of it. That’s right! The piss drinking that turned Grylls into an Internet sensation is back in full force. The best part is that these are perfectly reasonable survival situations, regardless of how absurd they are. It’s clear that Grylls is back into his Man vs. Wild element with this one. As for whether or not the show stands out, it both accomplishes this while falling back onto classic reality competition tropes. What sets the show apart from other programs is that a significant portion of it requires the group as a whole to work together. It’s not like the infinite number of other reality competition shows where people are put into teams and then compete ferociously from start to finish. Since the show is supposed to be about survival, this makes a lot of sense. If you’re alone in the wilderness with strangers, the best way to survive is through cooperation. Sabotaging others will most likely indirectly harm you as well. Each team falls into one of four groups – obstacle, food, shelter, and fire. Each team has a vital role to play and whether or not they successfully accomplish their personal task weighs heavily on their future with the show. For example, the pair that was eliminated tonight went home because they didn’t contribute to their task of providing food for the group as a whole. So not only must you do whatever you can to keep yourself in the game, you also must make sure your opponents stay in as well. It’s a nice twist on familiar formula. The show unfortunately falls back on typical reality competition tropes however. Since this was the premiere episode, the group is a hearty mix of those who clearly belong and those who definitely don’t. Within the first few minutes you can peg which team is destined to excel over others. This premiere episode already established the father-son team of Austin and Jim Vach and the father-daughter team of Andrew “Lucky” and Andrea “Louie” Larson as the real front runners. Then you have the teams that occupy the other side of the spectrum, like the already eliminated Vanessa and Erica who were slacking from the start. This means that, unless something crazy happens, we can already get a good idea of which team will make it and which team will go home at some point. This means that we have to wade through all of the crappy people who we already know won’t survive before we get to the real competition between equally strong teams. That happens far too often with reality competition shows and it just makes the show that less exciting to watch. I also couldn’t help but notice how the show fell back on typical gender roles far too easily. Everyone tried to do their best to contribute to the group, but when it was time to get down and dirty the men were usually the ones to step up. None of the women who were in the food group attempted to get the deer from the cave and they all backed away at the thought of skinning it. Cooking the food and setting up shelter was apparently more up their alley. It’s unreasonable to expect a reality show to not focus on common gender stereotypes, but seeing as the show is about survival, the people involved must be willing to do everything regardless of how gross it seems. It just really pulled me away from the program when I saw people actually refusing to do certain tasks that were necessary for them to live. 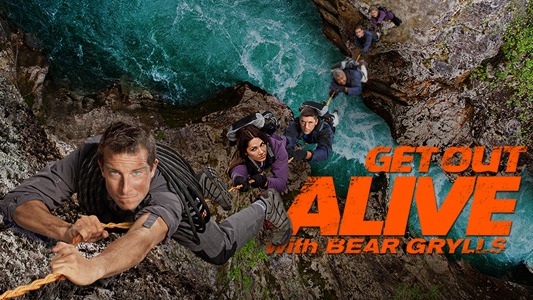 Get Out Alive with Bear Grylls is a truly fun show if that’s what you’re into. Fans of programs like Man vs. Wild and The Amazing Race will feel perfectly comfortable here as the most basic elements are very similar. The show also does a good job standing out from typical reality competition shows by making a point to have the group as a whole work together as opposed to always competing. However, it’s bogged down by the fact that too many of the teams are already weak and have no chance of finishing, making the show predictable, and it almost makes too much of a point to focus on gender roles. At least Bear Grylls is back, that guy is awesome. « The WWE-ek Special Edition: Who is The Wyatt Family?